viewed over 10,000 times since early October. In March the Windsor Observer reported that borough council leader Cllr. Simon Dudley has decisively rejected the Windsor Link Railway plans, as has the Department of Transport. Cllr. Dudley was speaking at the local Windsor Town Forum where he stated that he did not believe that the WLR was a viable scheme. The Windsor Express has also carried the report on page 5 of their issue dated 15 March 2019. There are a number of valuable and constructive ideas currently being promoted to improve rail access to Heathrow from north, south, east and west, but the Windsor Link Railway's proposal is NOT numbered amongst them! In the following, Windsor residents put forward their case as to why the WLR proposals are a nonsense and need laying to rest once and for all! Windsor Link Railway (WLR) have often claimed how appalling Britain's railways are and how the network has remained a series of unconnected lines and branches 'unbefitting of a modern state', and the truly ludicrous and unsupportable suggestion that Windsor, with its two independent railway lines, is somehow 'poorly served'. Their proposals however do nothing whatsoever to ameliorate that situation, if it is even remotely true, which most of us doubt. On the contrary. Windsor Link Railway will wreck our town centre for a significant period yet bring zero benefits to residents, and certainly none that could not be implemented very simply without the 'drama' that WLR proposes, especially when the other, far more mature rail schemes on offer elsewhere, are taken into account. WLR has been trying for almost ten years now, since 2009, to sell us the idea that linking our two railways to create just one station and one railway line is somehow better than the present two stations and two railway lines that currently serve the town. Both residents and businesses are being encouraged to believe the wholly false proposition that a railway link, slicing through the built-up riverside area of the town, is somehow a 'good idea'. It has been claimed that the proposal would increase footfall in the town centre, yet the concept encourages through travel, diminishing Windsor to just another station on the route from A to B. It has also been suggested that the ‘through railway’ would somehow encourage businesses to set-up in Windsor. We have yet to see any proof that this claim is supportable. Similarly, WLR claim that some 6.3 million visitors per year arrive by road and that a rail link would see an improvement (i.e. a reduction) in that figure. The trouble is the WLR proposal requires the removal of two railway stations in Windsor and replacing them with just one. We do not agree that the proposal can possibly improve matters and have seen no justification for the claim. On the WLR website there is a claim that 3,000 more jobs will be created. No evidence has been provided for this claim. Currently approximately 77,000 individuals are in employment locally with around 2,100 unemployed. (Source Nomisweb). In a contrived attempt to encourage local support, we are being offered other incentives such as an 'improved' riverside, an 'improved' railway service, more parking (but somehow with less traffic! ), extensive terraces of faux-Georgian 'Billionaire Mansions' and much faster connections to Waterloo, with more trains, as well as a connection to Heathrow. It is a shame that not one single proposed benefit will prove to be any more than either a pipe-dream, or a plan already included in the proposals of others elsewhere. The reasons why are set out below. Although WLR has been touted for almost ten years now, it is only comparatively recently that WLR has clambered on the Heathrow bandwagon and concocted an argument that their new tunnel will somehow improve links to Heathrow and elsewhere, including the saving of just a couple of minutes travel time between Windsor and Waterloo - but only, it appears, by introducing a previously unnecessary change of trains at Staines. The truth of the matter is that the lines into Waterloo are so congested that there is very little margin for any faster services from Windsor. Furthermore the level crossings along the route beyond Staines create their own restrictions because extending closure periods would be unacceptable. Nevertheless, South Western Railway have increased train lengths and promised that increased train services from two to four trains an hour will be introduced in May 2019. So that particular sweetie has already been removed from the WLR menu. SWR have since stated here that track capacity will not permit these two additional trains at off-peak times due to the need to use the 'slots' to maintain services to Weybridge. Service increases to four trains per hour therefore can only be introduced at peak times. WLR’s claim that they can offer four trains per hour throughout the day is unsupportable unless a shuttle service is employed between Windsor and Staines, with a train change at Staines. We believe that this would be unacceptable to Windsor rail users. In addition, the increased regularity of level crossing closures at Datchet would cause unacceptable delays to road traffic. As far as improving Heathrow accessibility goes, just a momentary glance at WLR's own proposed route map will illustrate that this particular ‘benefit’, despite conveniently omitting several stations en route to imply speed and convenience, is totally unconvincing, especially when the obvious advantages of the proposed link from the GWR line at Slough, the Western Rail Link to Heathrow (WRLtH) are taken into account. This 'quick and simple' rail link is a far more efficient and minimally destructive option which Windsorians will much prefer to use when travelling to the airport for the simple reason that it will be much quicker! Strangely the GWR - Heathrow option does not figure prominently on the WLR pages, yet the proposed connection will prove to be very valuable from the West Country, Wales, the North West, and even from northern England, because it offers very convenient access to the airport from all those parts of the country that has access to the GWR, Paddington, line. What is more, there is an excellent opportunity to link the GWR line to the Waterloo line simply by reinstating the track (which is still visible and undeveloped) between the GWR, Terminal Five (where a large station lies unused but ready) and Staines, thereby creating the link that WLR contrives to promote despite their meandering route, and causing major damage to the Windsor riverside and associated heritage areas in the process. We make that six stops followed by an inevitable train change at Staines to eventually get to Heathrow. Compare this convoluted route with the GWR link direct to Heathrow's terminals from Slough. Admittedly a train change at Slough may also be required by passengers, but given that the overall transit time would be just minutes, most Windsorians would be perfectly happy with that. This admirably elegant rail link between Slough and Heathrow is far less costly and disruptive because it routes beneath open countryside and not through our busy town centre. Surely preferable? Furthermore, WLR are implying that their magical mystery tour route from Slough around the dog-leg route to Heathrow would be accepted by the operators of Heathrow, the airlines, Network Rail, the Department for Transport, and the investors too for that matter. How could they possibly all say ‘Yes’ to a single track, two way, railway line through a tunnel? What are the chances that all interested parties would be happy to channel all their LHR traffic from the West Country, Wales and NW England along a single track in a tunnel under Windsor (and taking about 30 minutes or more and offering NO alternative route when things go wrong) when the WRLtH is simple and quick, and twin track? A rail industry professional has advised us that this restriction would constitute ‘a serious bottleneck, especially if it is to be part of WLR’s wider ambitions, for example a Reading to Heathrow route’. We agree! Bottlenecks lead to inevitable delays and will in no way result in the 'improved' rail service that WLR are claiming. There is therefore no need for the Windsor Link Railway in any shape or form whatsoever. That is what Windsorians have been saying all along. What does need to be said once more therefore, quite simply, is that the link railway is a nonsense as far as accessing the airport, or the Waterloo lines, is concerned when compared with other, far more mature and considered schemes such as those proposed by the Heathrow Southern Railway. The HSR offers far more than the contrived Windsor link ever could. Their scheme provides for convenient access from all compass points around the south of the UK, from Dover in the east to Weymouth in the west, a massive arc of convenient connections that link directly to Heathrow and which requires not one single inch of tunnel to be blasted through Windsor, no blighting of the riverside, no harming the visual amenity that are the views of our world famous castle, no destruction of National Trust land, no homes demolished, and no reduction of our public gardens to a mere roof terrace over a massive car park! WLR claims that rail links from the west to SW London are less than convenient currently and that a link though Windsor is therefore essential. Somehow the Reading - Waterloo line via Ascot doesn't get a mention, nor the Salisbury - Waterloo line, nor the north to south option known as the West London line. With the best will in the world I cannot see how a tunnel under Windsor improves any of those connections. As noted above, it will be impossible to improve rail service reliability when services are restricted to a single platform, single track, two-way operation. Almost weekly, delays on one or other of the lines into Windsor, or cancellations, or floods, or breakdowns or accidents, or level crossing incidents, etc., mean that services are disrupted. At least Windsorians have the option to use its other railway so that we still have a chance to go about our business thanks to the existence of two, totally independent, unconnected, rail services. What is more, the recent royal wedding and the massed crowds that visited Windsor on that day, demonstrated the very significant value in having two stations available, with multiple platforms, to handle the substantial demand. Whilst such events do not happen every week, they do happen often enough in our royal town and when they do, we are hugely grateful for the additional rail capacity. WLR last month (in September 2018) caused much worry and upset for residents living on the route that the new Windsor station and trackbed would require. Twenty-five attractive Victorian terraced houses, plus twenty Castleview House retirement apartments (for over 55s), are threatened with demolition, forcing out the elderly residents who were hoping to live out their lives there. Furthermore, the adjacent National Trust land, purchased by public subscription (and with royal patronage) in 1910 to preserve the world famous heritage views of Windsor Castle from the west, will be destroyed by this new station and ‘transport interchange’, which doubtless will comprise not only the station but extensive offices, perhaps even a hotel, and certainly yet more high-end, high value, apartments, thereby destroying a heritage site that is centuries old. Windsorians are proud that The Goswells, together with Alexandra Gardens, comprise a vista of almost half a mile from the west through to the Curfew Tower, with the Round Tower beyond. Destroying this view, or in any way harming the visual amenity, is tantamount to vandalism, as is the wholly unnecessary destruction of peoples' homes. It should be noted that, as far as The Goswells area is concerned, the National Trust is in a unique position as the freehold owner. The land is held inalienably, meaning it cannot be sold, mortgaged or even compulsorily purchased by the Government, as set out under the National Trust Act (1907). We wholeheartedly support this position because Windsorians now, as they did 110 years ago, require that all interested parties ensure that the land remains protected permanently and in perpetuity. In short, The Goswells is permanently protected, which is what Windsorians want and what they expect the borough to honour. how public gardens should be presented! The contrived link railway involves substantial engineering in the town, beneath the castle walls, with extensive developments of expensive apartments overlooking either the river, the castle, or both, the construction and sale of which are said to be required to generate the funds WLR needs to finance their project. Windsorians are concerned that these very numerous apartments, some suggest perhaps 500 properties from the east of the Riverside Station to the west of Alexandra Gardens, will be built and sold. But what happens when the desire to build a link railway fades from sight and is somehow conveniently 'shelved'? Property development is always more rewarding than creating a railway! The WLR proposes a new use be found for the award-winning Riverside Station. It also requires that a massive gash be cut in the arches to accommodate the trackbed as it rises out of its cutting, plus new roads through the present River Street car park and along the line of Stovell Road requiring a contrived link to the Royal Windsor Way, (but which would probably have to be at the Boys' School junction to meet Highways construction regulations). Much more, related to the required infrastructure, is also proposed, not least the massive underground car park beneath Alexandra Gardens. The damage to the local economy during all this construction will be substantial and significant, and may well never be justified economically, however long the period of recovery. With High Streets experiencing much ‘stress’ these days with the advent of online shopping, the additional damage to the local economy by the WLR proposals must not be permitted. Sadly none of the WLR claims we have looked at above are either true or desirable, but let's take a look at traffic. Despite a curious claim that 95,000 tonnes of CO2 will somehow be saved by WLR's implementation, they also propose a very large car park in the town, quoted as accommodating perhaps as many as 3,000 cars. This will be constructed underneath the much loved, Victorian, Alexandra Gardens. Access is proposed from Goswell Road in the east and Stovell Road from the west, under the arches (rather than through them) at Barry Avenue. A totally reconstructed set of access ramps leading to and from the Royal Windsor Way are proposed but it seems very unlikely that such a reworking of the present Maidenhead Road on and off ramps will be possible, or even acceptable from a Highways point of view, as previously mentioned. Residents are also concerned at the prospect of the inevitable significant increase in road traffic past the Leisure Centre, much frequented by children of all ages, often by bike or on foot. WLR claim that traffic will be reduced through the centre of Windsor, but we remain unconvinced. The coach park is moved to a point adjacent to the 'Camm Terrace' where there is currently a small car park. The coach park will therefore be smaller than the present (often full) coach park, and will be directly over the garden walls of homes in Alma Road and Arthur Road. Residents will not be pleased by the noise and smell of diesel engines all day long, or the intrusion of coach passengers for that matter! Arthur Road will remain busy as drivers make their way to the King Edward Court car park and the proposed underground car park. Whilst access via Stovell Road might provide some small relief, it will not be the panacea that WLR would have us believe. Arthur Road will always be a busy road, after all, there is railway station proposed along that route too! So why is WLR still being touted around? We have demonstrated above that access to Heathrow from the four corners of the compass will be amply provided for without wasting effort on a spurious Windsor link so why do the promoters keep banging on about it? Could it be the possibility of big rewards through the construction of several hundred expensive billionaire mansions along the riverside? Could it be the possibility of similar rewards through the construction of hotels? Could it be the 'expectation of plenty' through the construction of office blocks? Ah... one million square feet of development potential... Ahhhhh! Readers will note the totally baseless claim that Windsor's riverside is ‘neglected’!! This is just so far from the truth as to be laughable, but if the price residents must pay is Billionaire Mansion Row, and the loss of some of Windsor's most prized assets, then we will live with the ‘neglected’ riverside. The truth is however that there is very little in our town that is ‘neglected’, nothing that a bit of litter picking and a few more flower beds won't fix! The Windsor Link Railway proposals originally suggested the re-creation of the ‘Royal Curve’ at Slough. This linked the branch line to Windsor with the GWR tracks to the west. We suspect that use of this curve at any point in the future, especially two or even four times an hour would be very difficult to implement because of the high frequency of main line services to and from Paddington, often high speed, ‘through’ trains which would preclude the use of, or the crossing of, these high speed tracks by trains to or from Windsor. The matter requires further investigation. Further to the above, an additional full size platform for services to or from the west would be required, as well as the extension of the existing platform one currently used by the Windsor shuttle. It is unclear who will operate these new services, be it South Western Railway or Great Western Railway. Would GWR be happy to give up its operation of the Windsor shuttle? Would SWR be happy to take it on given the implications relating to increased rolling stock associated with longer routes? What is the demand (load factor) for passenger travel from GWR destinations to SWR destinations that is not already catered for by existing, alternative routes? The WLR proposals simply will not wash. The rail link is demonstrably unnecessary, the threat to Windsor businesses and existing private homes is too great, massed development along the riverside is not wanted and the loss of Windsor's heritage sites is unacceptable. Furthermore, the suggested extension of Alexandra Gardens to the riverside is simply achieved, should we so wish, without the massive developments from Romney Lock Road to Stovell Road. The reduction of our Public Open Space to nothing more than a roof terrace while the National Trust Goswells is lost permanently to a travel interchange complex, plus new roads and new (hi-rise) hotels and office blocks and faux Georgian terraces are really not what we want for the town. 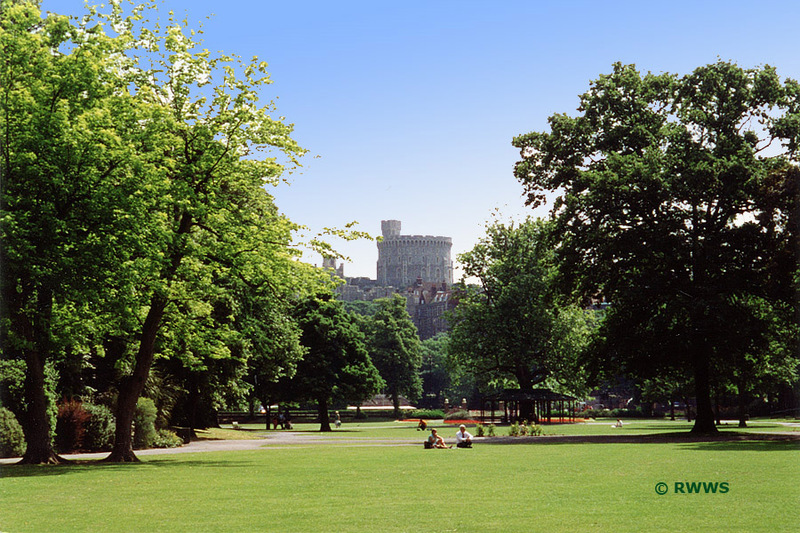 The loss of the most famous view of Windsor from the west, matched only by the castle itself, or the Long Walk, should preclude such vandalism to this visual treat but these additional lost views compound the reasons to reject the WLR proposals permanently. It really is about time, after ten years of 'no interest so no progress', to knock this wholly inappropriate scheme on its head once and for all. Windsorians just should not have to worry about such nonsense any more! A bit of a pickle? The Windsor Observer reports that the threatened Windsor Link Railway will not be discussed at an upcoming Windsor Town Forum meeting, despite pressure from residents to have the matter added to the agenda. Cllr. Rankin has stated that the item missed the deadline for the agenda. I have no doubt that Cllr. Rankin has worked hard for his ward residents on many matters but on this occasion he seems to have ‘mis-spoken’ by giving the impression that the matter could be addressed, and then deciding that it could not be. It remains to be seen why this change of heart came about. It is inevitable that some residents are concerned that someone has been nobbled! Time will tell! WTF (unfortunate acronym!) only meets twice a year and so, as an incisive and important forum for residents to discuss pressing matters, it is useless and is trying hard to live up to its initials! Whilst it is true that the Windsor Link Railway plans are privately promoted (and funded, but no sign of that yet) the kindest thing to do would be to have a quiet word with the promoter and point out that it is a non-starter, a fact that the little group connected to it seems not to have appreciated over the last ten years. The borough owes that to the fifty or so home owners in Bridgewater Terrace who have had to live for years under the threat of losing their homes, and, it seems, for years more to come. The RBWM cancelled Monday's Windsor Town Forum (29th October) ‘due to the pre-election period’ in Datchet. The validity of this decision was a concern especially because of the ludicrously late notice - just one working day. However a meeting still took place run BY residents FOR residents at the Prince Harry Pub, next door to the Guildhall. A large number of residents were proposing to attend the WTF on Monday and turned up at the Prince Harry PH instead. The Windsor Express carried a report here. We hope that a new meeting date will be organised at the first opportunity. It might be Halloween, but the spectre of WLR is no joke! Windsor MP Adam Afriyie asked the Secretary of State for Transport, how many rail market-led proposals for the construction of new railways by private sector firms he has received; and if he will list those proposals. Jo Johnson, Minister of State at the Department for Transport and Minister for London from 9 January 2018 to 9 November 2018, replied: The department has received 30 responses to its call for ideas for market-led proposals to enhance the railway, which it launched in March this year. These submissions covered a wide range of railway enhancements, but the department cannot make an announcement about individual schemes at this time as these proposals were submitted in confidence and such disclosure may prejudice the commercial interests of the proposers. Individual promoters will be contacted later in the autumn. From the above, it is to be assumed that the next stage regarding the Slough - Heathrow rail link (as outlined above) will be announced shortly, apparently before Christmas. We are of the opinion that if the WRLtH goes ahead, there will be no reason whatsoever for a link through Windsor from Slough to Heathrow, at which point the project should be scrapped once and for all. The Windsor Observer is reporting here that WLR promoter George Bathurst may be submitting a variation of his plan to the Department for Transport. Given the bad press that Transport Minister ‘No Ferries’ Grayling has been given on regular occasions, we suspect that a U-turn on his part is totally impossible, and that this is indeed a dream on the part of WLR promoter Bathurst, and a nightmare for the rest of us. We are awaiting a statement by Cllr. Dudley who agreed with the DfT decision to reject the WLR proposals last December. It is certainly about time that the RBWM officially announced that the WLR is obviously an unpopular idea and put it out of its misery once and for all.